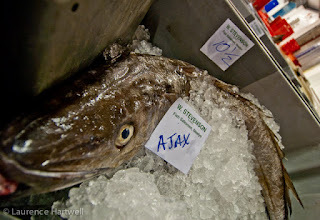 MSC Accredited Cornish hake from the Ajax - one of fifteen certified hake fishing boats. 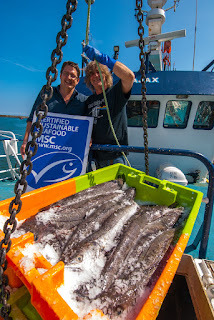 Cornish hake is MSC certified as sustainable! 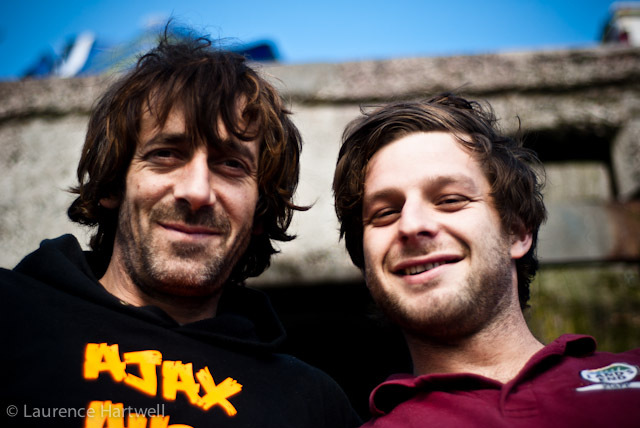 It's smiles all round from the boys who catch hake! After years of seeing South African hake on the wet fish counters of supermarkets throughout the UK despite fishermen seeing an abundance in our own waters. Local speciality fish, Cornish hake, has achieved Marine Stewardship Council (MSC) certification as a sustainable and well-managed fishery. This latest recognition means that, subject to strict traceability requirements, Cornish hake can be branded with the widely-recognised blue fish ecolabel. Cornish hake has been a popular species for many years, but the stock was left slightly depleted in the late 1990s. Now, thanks to sacrifices by fishermen and a new management plan set up in 2001, hake stocks have recovered to nearly double their low point. One of the fishery’s key strengths is the use of nets with larger mesh size than the legal requirement. These nets only target the larger hake fish and allow the smaller, juvenile fish to swim free, leaving more fish to reproduce. 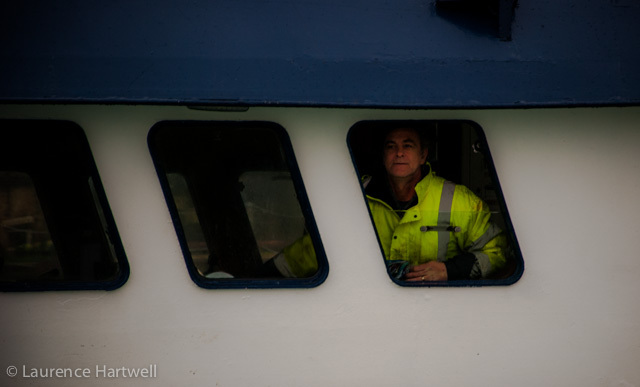 Cornish fishermen work from a fleet of 15 boats catching hake in the Celtic Sea to the west of the UK mainland and south of Ireland. Together they land just under 1,000 tonnes of European hake (Merluccius merluccius) per year into Newlyn, Cornwall from the boats, which range from 12 metres to nearly 23 metres long. 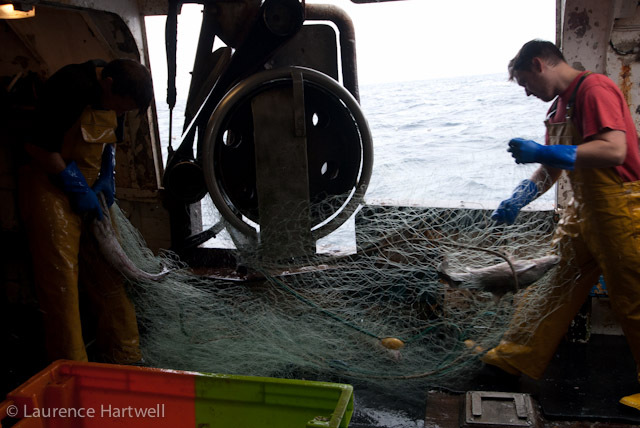 The Cornish vessels certified to catch MSC Cornish hake already use a larger mesh size than required by EU regulations, which allows juvenile fish to escape and helps safeguard stocks for the future. Landings of hake from the 15 boats in the fleet have been steadily increasing as the abundance of hake has been rising, and in 2014 nearly 1,000 metric tons of hake were landed into Newlyn in Cornwall. "Obtaining MSC certification has been a lengthy and rigorous process but we're very proud to have finally achieved it," said Alan Dwan, skipper of the Ajax. 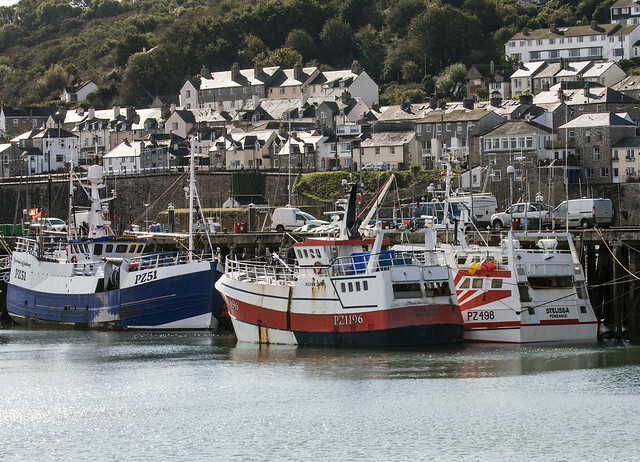 "This is great news for the hake catching fleet but also for the wider Cornish industry and hopefully will help to bring more Cornish seafood into the spotlight." European hake are found along the continental shelf and the shelf slope in the north-eastern Atlantic from northern Norway and Iceland south to Mauritania. They normally live at depths of 100-300 m from Ireland south to Gibraltar and in the Mediterranean Sea. The main market for Cornish hake is in Europe, particularly Spain, France & the UK. Fish are sold as fresh, whole, gutted fillets and steaks into retail and restaurants. The Cornish industry has been involved in a number of initiatives to demonstrate its sustainability and this is a significant milestone, illustrating the progress that has been made, the organization said in a statement. Achieving MSC certification for Cornish gill-net hake enables the industry to demonstrate its sustainability credentials to the supply chain, through a recognized and independently verified standard. 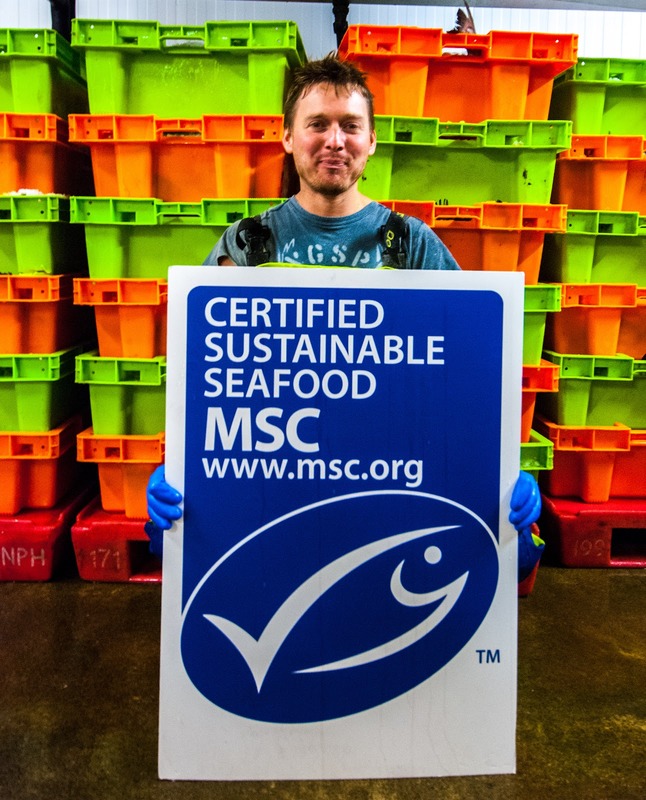 It also ensures that top quality hake landed by Cornish vessels is available to the most discerning customers, who seek out the MSC’s blue fish ecolabel. Mark Greet, managing director of Falfish -- a Cornish company supplying into the foodservice and retail sectors throughout the UK and Europe -- said: "We have demonstrated a long-term commitment to sustainable sourcing and as part of that we continue to support MSC certification of some local fisheries." "We are therefore delighted that the Cornish FPO has been successful in getting Cornish gill-net caught hake certified to MSC standards, and we look forward to promoting it to our UK and European retail customers." 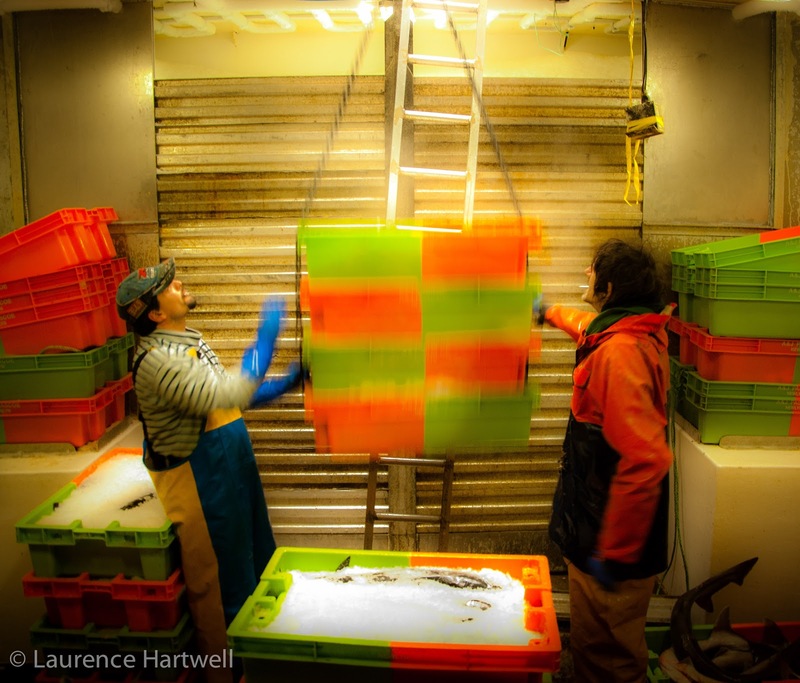 The Co-operative Group set up a £200,000 fund to help support fisheries complete the Marine Stewardship Council (MSC) certification process in 2010. 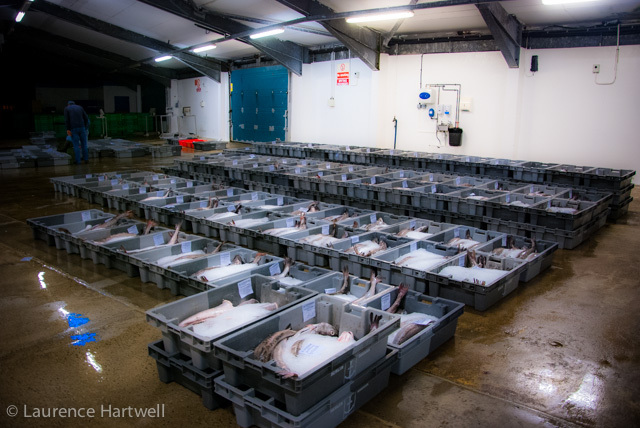 The Cornish gill-net hake fishery is the fourth fishery in the south west to be supported through the MSC assessment process by the retailer and is the first to gain MSC certification. Stuart Smith, Technical Manager with The Co-operative Food, said: “We are pleased to hear that the Cornish hake fishery has achieved MSC certification and we will be reviewing opportunities to use MSC certified Cornish hake in our seafood range. “We are proud of how the industry has responded to the challenge of working with scientists to better understand the state of fish stocks and where action has been needed to improve stocks it has been taken. What better way to demonstrate that than going through MSC assessment“, said Paul Trebilcock, CEO of the Cornish Fish Producers Organisation (CFPO), which is leading the move for certification. The CFPO was established in 1976 as a non-profit making co-operative, and today consists of 210 fishing vessel-owning members from all over Cornwall. It represents the views of Cornish fishermen locally, nationally and internationally. · It comes from a wild-catch fishery which has been independently certified to the MSC’s science-based standard for environmentally sustainable fishing. · It’s fully traceable to a sustainable source. More than 260 fisheries in over 30 countries are certified to the MSC’s Standard. These fisheries have a combined annual seafood production of almost nine million metric tonnes, representing close to 10% of annual global yields. More than 27,000 seafood products worldwide carry the MSC ecolabel. conversely, some things never change and there are occasions when you just have to put up with poor weather - here the Ajax is steaming into the weather as she shoots her nets back in the water.